WHAT IS IT? KTM’s right-side axle block is threaded onto the rear axle. Japanese-built bikes have a flange on one end of the axle and a threaded nut face on the other end. 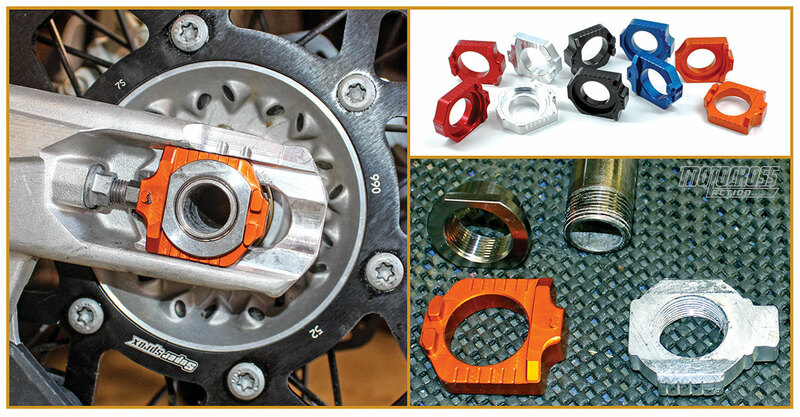 The KTM system makes the threaded-on axle block serve as both an axle block and an axle nut. This may have seemed like a good idea at the factory, but it has some limitations. The KTM factory team did not think it was a good idea to bond the axle block to the rear axle. The solidly linked axle/axle block combo didn’t allow the axle to move freely under a load, and it locked the axle and swingarm together into an overly rigid single unit. Thus, the KTM factory bikes use a Japanese-style rear axle and specially machined aluminum axle block. Works Connection has made a kit that allows local racers to do the same thing while using the stock axle. CONTACT? www.worksconnection.com or (530) 642-9488. WHAT STANDS OUT? Here’s a list of things that stand out with the Works Connection KTM Axle Block kit. (1) Installation. You will need the axle from your bike, a 32mm open-end wrench and, in a pinch, a propane torch. 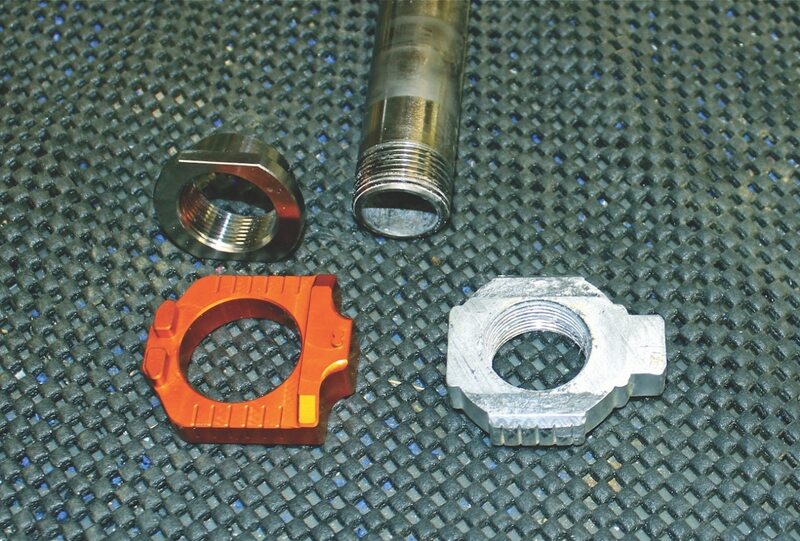 To remove the threaded-on right-side axle block from the axle, Works Connection has included a special 32mm locking nut that threads onto the normally threaded side of the axle and is then jammed in place by tightening the stock axle nut down against it. This allows you to turn the complete axle with a 32mm wrench. Place the thread-on axle block into the jaws of your vise with the axle sticking straight up. Put a 32mm wrench on the special lock nut and unscrew the axle from the axle plate. Once you have the axle free from the axle plate, unlock the lock nut and axle nut. The final step is to put the new Works Connection right-side axle nut on the axle that you just removed the axle block from. This is the hardest step. We use red Loc-tite to secure it. That turns your KTM axle into a Japanese-style axle, which will work with the supplied axle blocks. (2) Flex. 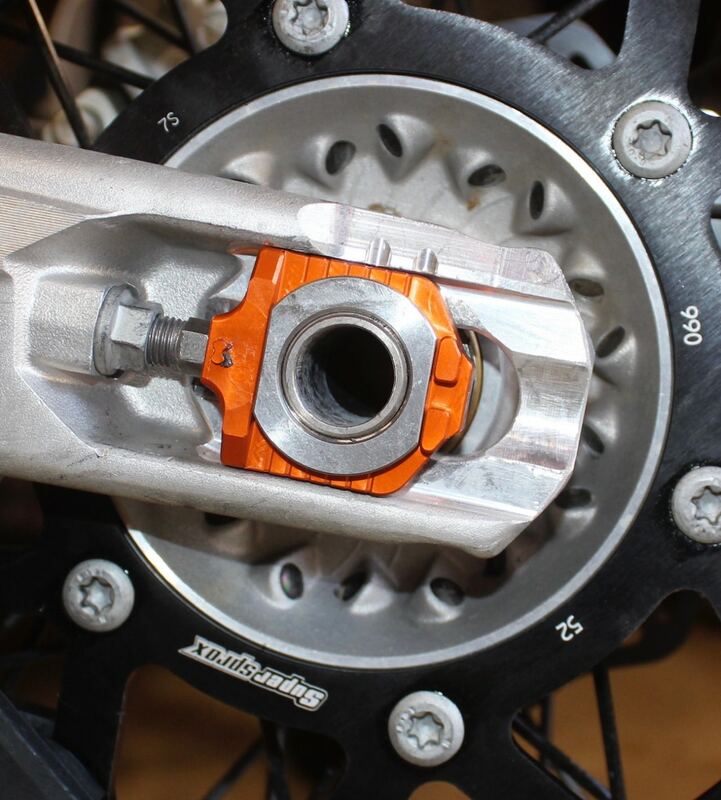 Since the swingarm of a motocross bike flexes both torsionally and vertically, when KTM integrated the right-side axle block with the axle, it made the rear axle and swingarm into one solid piece. In short, when the swingarm moved up, the axle was not free to find its own center in the rear wheel, but instead moved with the swingarm. Since the rear axle is subject to tremendous loads, having the rear axle and swingarm locked into one solid piece, meant the axle was forced to take more loads than if it were a free-floating part that held the wheel in place. (3) Trickle down. The Works Connection Axle Block kit eliminates the one-piece axle/axle block on the KTM. Instead, it allows the axle to float inside the axle block—and not impart any drag, stiction or torque on the suspension. It works, proven by the fact that the KTM factory team has used the design since 2014. Will you feel it? It requires a very sensitive test rider to notice the difference in deflection and the freer feel of the rear suspension in motion, but they are still there. Of course, the faster and rougher the course, the more noticeable the difference will be. WHAT’S THE SQUAWK? No complaints. But, we don’t think the average Novice or Vet is going to feel anything. MXA RATING: For Roger DeCoster, all of the little improvements add up to a big improvement. Any aspiring National Pro would make this mod to keep up with the factory team. For the rest of us, it’s a cool idea that we mightor might not appreciate.